A few weeks ago I was at the Rob Roy, in Seattle, celebrating a friend’s birthday. The men’s room at Rob Roy is covered in graffitti, like pretty much any men’s room at any bar, only the scribblings at Rob Roy aren’t just of random profanity. They’re cocktail recepies. Yes dear readers, it just so happens that today’s drink came to me in a public bathroom. But, hey, sometimes inspiration comes from unexpected places. Pour all components into a mixing glass over ice and stir. Strain drink into a cocktail glass over a nice, fresh ice chunk. Garnish with a blood orange peel. 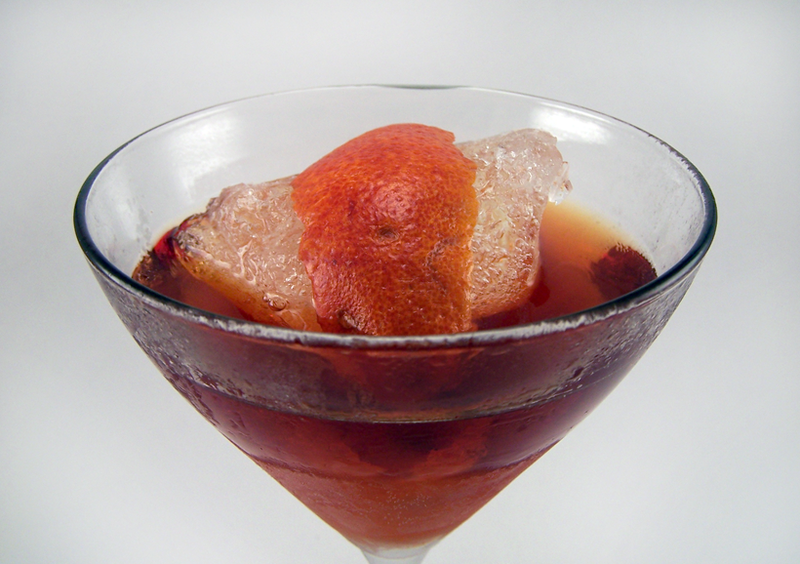 It has become popular recently to templatize the negroni. The classic negroni is an equal parts drink made of gin, sweet vermouth, and Campari. Although this ratio tastes fine, it isn’t my favorite. I find that the texture of an equal parts negroni is overwhelmingly syrupy because of the amount of Campai used. Also, I find that in this ratio the Campari’s bitterness overpowers the gin and vermouth. These days it seems to be more popular to use a 3:2:1 template, which does a great job of addressing these two critiques. In this version we used 6:3:1 because the original recipe I saw in the bathroom at Rob Roy called for Aperol, not Campari. Some handy advice: you can substitute Campari for Aperol and get away with it as long as you use half as much Campari. La Vida Buena is a mezcal version of the old, classic drink. Personally, I prefer the smoky taste of mezcal in a negroni over gin, as I enjoy the additional layer of complexity it brings to the glass. I also simply love mezcal, and pretty much anything that has mezcal in it. The aroma from the blood orange peel lends the sip a subtle tartness that plays well with vermouth, and foreshadows the bitters from the Campari, which linger after the swallow. Categories: classics | Tags: alcohol, bartending, blood orange, booze, campari, cocktail, cocktails, drinking, drinks, mezcal, mezcal negroni, mixed drinks, mixology, negroni, sweet vermouth | Permalink. Wouldn’t it look better on the rocks in an old fashioned glass? Yes, I agree, it would have looked better in an old fashioned glass… But sometimes all you have is a cocktail glass! Yeah, I know that feel.